Breezeway events include the much-loved Breezeway Cruise. A fine example of collaboration in northern Michigan is a project both officially and affectionately known as The Breezeway. County Road 48, aka The Breezeway, is a gorgeous 28-mile stretch connecting Boyne Falls to East Jordan to Ellsworth to Atwood. It has all the crucial elements of a nostalgic rural route—gliding up hill and down vale, winding ‘round reflective lakes and slipping past historic farms. 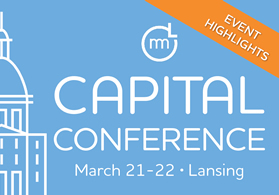 It is a stunning scenic drive in each of Michigan’s distinctive seasons and those capricious days between. 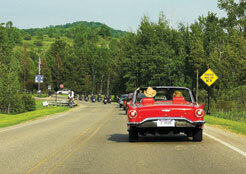 In June, the 2nd annual Breezeway Cruise saw classic cars, motorcycles, hot rods and pick-ups, all bearing a common denominator—their drivers love this ride! The same can be said of Memorial Weekend, when hundreds participated in the first (and possibly annual) Breezeway Garage Sale, a locally adapted version of the “World’s Longest Yard Sale” along 127 from Ohio to Alabama. C-48 has long been a favorite route of both residents and visitors. The idea for “branding” the route germinated from a seed planted about seven years ago as one recommendation within a greater Chain of Lakes marketing study. “Branding” builds a public image or identity allowing for businesses and communities along the route to be promoted through marketing events as part of a larger whole. This helps a rural area become its own destination “point.” A number of entities presented the proposed project in application for one of the governor’s Regional Centers for Excellence Award grants and received $25,000 over two years. Entering its second year, The Breezeway promises to be worthy. The Breezeway branding efforts included creating a website with the brand identity, tying all of community partners and businesses together through maps and listings. Distinctive signs were posted along the route with a ribbon-cutting at each, generating enthusiasm and media. In addition to the garage sale and classic car cruise, there is a fall color tour with a Halloween costume theme beginning in Atwood and ending with a chair-lift ride at Boyne Mountain. The events are organized through the East Jordan Area Chamber of Commerce for the benefit of more than 200 businesses along the route, including a hand-blown glassworks. The route also features numerous agri-businesses including historic Stone Hedge fiber mill where visitors can purchase wool products and watch the entire process from shearing to dying. Both the Quilt Cottage and Soaps ‘n Such report visitors from Battle Creek, Jackson, and Kalamazoo arriving with news clippings of The Breezeway. There are resale shops for those who love recycling and benefiting others and the East Jordan Area Arts Council provides mini exhibits and workshops. Each of these unique places was like a loose gemstone, easily lost or overlooked, now linked together in a magnificent display that is The Breezeway. 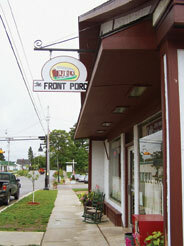 A true community development project, The Front Porch is a non-profit community café, opened after the only local diner closed. There are two paid employees—the cook and manager—the rest are volunteers. Photo by William D. Jackson. The village of Ellsworth, struggling with 16-percent unemployment faced tough times the past two years as their only local diner and grocery store both closed their doors. Residents were left with nowhere to connect for even a cup of coffee. Meanwhile, a number of good-hearted citizens were mulling over bright ideas, and together they reopened the diner as The Front Porch—a non-profit community cafe serving breakfast and lunch from a menu with suggested donation amounts, instead of prices. It’s a local place for non-denominational fellowship and welcomes everyone. Only the cook and manager are employed, all others volunteer. At 3:00 pm, when the cook goes home, a fresh pot of coffee is left for those still socializing. Literally, the last one to leave turns out the lights. NPR and a number of other media outlets featured the story, and coupled with its connection to The Breezeway, this unique diner is now a popular tourist stop, which is great for local business. A true community development project, the café now fosters economic development. For more on The Front Porch, check out www.frontporchellsworth.org or locate them through www.ridethebreezeway.com. Congratulations to Boyne City for winning NLEA’s Project of the Year award for their One Water Street project, a $12 million waterfront complex including restaurant, commercial, retail, hotel and marina components. Caroline Weber Kennedy is manager of field operations for the League. You may reach her at 906-428-0100 or ckennedy@mml.org.